Advanced Social Widget Aweber Edition adds an advanced widget box to your WordPress theme sidebar giving users the ability to link your site to all the popular Social Networking sites such as Delicious, Twitter, Facebook, StumbleUpon, Pinterest, LinkedIn, Youtube and access to FeedBurner & Aweber Email Subscription. Advanced Social Widget Aweber Edition is an all-in-one social networking widget plugin that allows your visitors to subscribe to your RSS feed, subscribe to your Aweber mailing list, Follow you on Twitter, visit your Facebook Page and easily share your site, categories & posts to the major social networking sites. You can define what social network sites you want to show and what icons to display. Define whether to display the social networking site name under each of the icons. Visitors can Follow you on Twitter, subscribe to your FeedBurner RSS Feed and view you FeedBurner RSS Feed. Visitors can subscribe to your Aweber newsletters through an easy to use AJAX powered interface. You can also define the width of the widget making it suitable for most available WordPress themes without having to get in change any code. The widget is also responsive and will respond to different screen resolutions and devices. The Widget has been developed to he highest quality standards and tested in all major modern browsers. Highly functional dynamic widget interface. Ability to change the Widget title & internal box title. Subscribe to Aweber Newsletter List – Select which fields you wish to gather and visitors are able to subscribe to your Aweber newsletter list. Options are to gather firstname, surname and email address or simply email address only. Newsletter subscription is carried out through a easy to use AJAX interface. Dynamic Google 1 features & follower count. 4 different Google buttons variations to choose from. Facebook Like features and Like count. 3 different Facebook buttons variations to choose from. Links to your Pinterest account and page. Ability to display certain features and disable certain features, IE You can hide Google +1 and other social networking links and icons. Ability to disable the viewing of the bottom social networking icons altogether. Ability to select between an inline layout or a wide layout for the Aweber subscription form. Customize the textfield placeholder text and subscribe button text. Unlimited backgrounds to choose from. Ability to customize the link and button colors. Select which fields you wish to gather and visitors are able to subscribe to your Aweber newsletter list. Options are to gather firstname, surname and email address or simply email address only. Newsletter subscription is carried out through a easy to use AJAX interface. If you have inserted a FeedBurner RSS username in the widget configuration panel, a link will be displayed where visitors can view your RSS feed. Display a Google +1 button on your site and let your visits quickly and effortlessly +1 your site. The URL for the button is dynamic and is the same URL as your current site, so no need to configure. Have a Facebook page connected to your site? Display a Facebook “Like” button on your site and let your visits quickly and effortlessly like your site. Effortlessly display a Twitter Follow Button to your site. Displays the total amount of Twitter Followers you have. Configure Twitter Username through widget configuration settings. Allow users to save your site URL to Delicious. If you are on the homepage of the site the button will link to the site URL. If you are on a category or an article page, the button will allow visitors to save the URL for that certain category or article page. Display the Twitter icon and visitors can instantly visit your Twitter page. Configure Twitter Username through widget configuration settings. Display the Facebook icon and visitors can instantly visit your Facebook page. Configure Facebook URL through widget configuration settings. Display the Email icon and visitors can visit the FeedBurner RSS Subscription page to easily subscribe to your site’s RSS feed. Allow users to save your site URL to StumbleUpon. If you are on the homepage of the site the button will link to the site URL. If you are on a category or an article page, the button will allow visitors to save the URL for that certain category or article page. Display the Pinterest icon and visitors can instantly visit and follow you on Pinterest. Configure Pinterest Username through widget configuration settings. Allow users to save your site URL to LinkedIn. If you are on the homepage of the site the button will link to the site URL. If you are on a category or an article page, the button will allow visitors to save the URL for that certain category or article page. Allow users to easily browse to your Youtube page. Included in version 2 is the ability to drag & drop the Social Networking icons into any order you desire. Display or hide individual icons. Select any of the 5 available Social Networking icons sizes ranging from small icons of 16px to larger icons of 32px. Select any of the predefined 12 pattern backgrounds or unlimited solid & gradient backgrounds all visually displayed. Divided into solid colors, gradients, patterns or decide to have no background at all. When future updates of the plugin is released you are notified through your WordPress Dashboard with instructions on how to download and install updated versions. The plugin includes detailed documentation with installation instructions and usage instructions. Thanks again for the wonderful support. it is very impressive that you are constantly changing your plugins to be user friendly and integrate with as many themes as possible. Upload the the plugin folder “asw-aweber-edition” (not just the files in it!) to your `wp-content/plugins` folder. If you’re using FTP, use ‘binary’ mode. 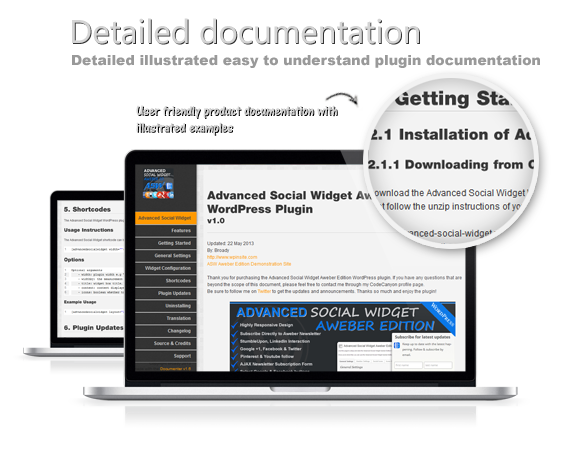 Navigate to the WordPress Dashboard widgets page, drag the “Advanced Social Widget Aweber Edition” widget onto one of your WordPress theme sidebars.